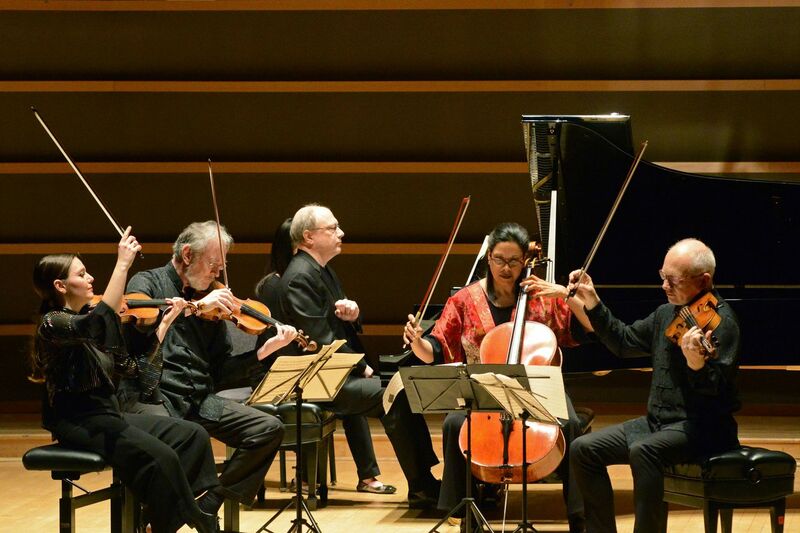 Sunday afternoon at the Perelman Theater, the Juilliard String Quartet and pianist Marc-AndrÃ© Hamelin perform the DvorÃ¡k Piano Quintet in A Major, Opus 81. The Juilliard String Quartet continues to evolve. The group, founded in 1946, arrived onstage at the Perelman Theater on Sunday afternoon profoundly changed from its previous form of three years ago. That 2016 concert was a farewell for its cellist, Joel Krosnick. His successor, Astrid Schween, was firmly in her chair Sunday, as was a new first violinist, Areta Zhulla (replacing Joseph Lin). Does any of this matter to anyone beyond the first circle of string aficionados? It does. The Juilliard stands for something in the larger musical universe, and whether it continues to stand for something very much depends on its cohesiveness and strong sense of personality. It is known for Schubert and Beethoven, and continued the new music aspect of its work nicely Sunday in this Philadelphia Chamber Music Society concert. Lembit Beecher has had a foot in the city as an opera composer, and was much lauded with last season’s premiere of his Sky on Swings in Opera Philadelphia’s O18 festival. But Beecher, who was an Opera Philadelphia composer-in-residence for three years, has a lot of moves, as the Juilliard showed in his One Hundred Years Grow Shorter Over Time. Trills like birds, a pizzicato cello part that bubbles like a brook, intimation of wind and insects — it’s hard to know just how consciously Beecher sought to evoke nature in the lovely third movement. But what a wonderful meeting of performer and material he struck upon for the closing viola solo. Roger Tapping’s almost subliminal sound was both extremely quiet and present — as “an old, distant recording,” a note in the score says — before the piece fades to black. Tapping, in fact, represents a sound ideal worth heeding in an ensemble changing around him. Beethoven’s String Quartet in D Major, Opus 18, No. 3 featured bright, crisp playing from Zhulla, and generally sturdy playing from the others (Ronald Copes played second violin). But there is something special about Tapping, an inner glow. He was an elegant presence in Dvorak’s Piano Quintet in A Major, Opus 81, especially in the second movement. And there was much to admire elsewhere. Pianist Marc-André Hamelin brought clarity and a business-like sense of purpose to his part. In such spots as the end of the first movement, where other groups can go off the rails with questionable intonation or tone quality, these five were unfazed. This was a performance, above all, of high polish and efficiency. NFL draft 2019: How many picks did Mel Kiper, Todd McShay and Daniel Jeremiah actually get right?